The Numismatic Notes and Monographs series, established in 1920, is generally for shorter book-length works on relatively specific topics. It is published in 6″ x 9″ hardcover format. Noe, Sydney P. 1920. Coin hoards. Numismatic Notes and Monographs, no. 1. New York: American Numismatic Society. Newell, Edward T. 1921. The octobols of Histiaea. Numismatic Notes and Monographs, no. 2. New York: American Numismatic Society. Newell, Edward T. 1921. Alexander hoards…Introduction and Kyparissia hoard. Numismatic Notes and Monographs, no. 3. New York: American Numismatic Society. Wood, Howland. 1921. The Mexican revolutionary coinage. Numismatic Notes and Monographs, no. 4. New York: American Numismatic Society. Westervelt, Leonidas. 1921. The Jenny Lind medals and tokens. Numismatic Notes and Monographs, no. 5. New York: American Numismatic Society. Baldwin, Agnes. 1921. Five Roman gold medallions or multiple solidi of the late empire. Numismatic Notes and Monographs, no. 6. New York: American Numismatic Society. Noe, Sydney P. 1921. The medallic work of A.A. Weinman. Numismatic Notes and Monographs, no. 7. New York: American Numismatic Society. Perez, Gilbert S. 1921. The mint of the Philippine Islands. Numismatic Notes and Monographs, no. 8. New York: American Numismatic Society. Smith, David E. 1921. Computing jetons. Numismatic Notes and Monographs, no. 9. New York: American Numismatic Society. Newell, Edward T. 1921. The first Seleucid coinage of Tyre. Numismatic Notes and Monographs, no. 10. New York: American Numismatic Society. Gillingham, Harrold E. 1921. French orders and decorations. Numismatic Notes and Monographs, no.11 . New York: American Numismatic Society. Wood, Howland. 1922. The gold dollars of 1858, with notes of the other issues.Numismatic Notes and Monographs, no. 12. New York: American Numismatic Society. Whitehead, Richard B. 1922. The Pre-Mohammedan coinage of northwestern India. Numismatic Notes and Monographs, no. 13. New York: American Numismatic Society. Hill, George Francis, Sir. 1922. Attambelos I of Characene. Numismatic Notes and Monographs, no. 14. New York: American Numismatic Society. Vlasto, M.P. 1922. Taras Oikistes: A contribution to Tarentine numismatics.Numismatic Notes and Monographs, no. 15. New York: American Numismatic Society. Wood, Howland. 1922. The commemorative coinage of the United States.Numismatic Notes and Monographs, no. 16. New York: American Numismatic Society. Brett, Agnes Baldwin. 1923. Six Roman bronze medallions. Numismatic Notes and Monographs, no. 17. New York: American Numismatic Society. Wood, Howland. 1923. The Tegucigalpa coinage of 1823. Numismatic Notes and Monographs, no. 18. New York: American Numismatic Society. Newell, Edward T. 1923. Alexander hoards: II Demanhur hoard. Numismatic Notes and Monographs, no. 19. New York: American Numismatic Society. Gillingham, Harrold E. 1923. Italian orders of chivalry and medals of honour.Numismatic Notes and Monographs, no. 20. New York: American Numismatic Society. Newell, Edward T. 1923. Alexander hoards: III Andritsaena. Numismatic Notes and Monographs, no. 21. New York: American Numismatic Society. Seltman, Charles T. 1924. A hoard from Side. Numismatic Notes and Monographs, no. 22. New York: American Numismatic Society. Seager, Richard B. 1924. A Cretan coin hoard. Numismatic Notes and Monographs, no. 23. New York: American Numismatic Society. Milbank, Samuel, R. 1925. The coinage of Aegina. Numismatic Notes and Monographs, no. 24. New York: American Numismatic Society. Noe, Sydney P. 1925. A bibliography of Greek coin hoards. Numismatic Notes and Monographs, no. 25. New York: American Numismatic Society. Newell, Edward T. 1925. Mithradates of Parthia and Hyspaosines of Characene: A numismatic palimpsest. Numismatic Notes and Monographs, no. 26. New York: American Numismatic Society. Noe, Sydney P. 1926. The Mende (Kaliandra) hoard. Numismatic Notes and Monographs, no. 27. New York: American Numismatic Society. Brett, Agnes Baldwin. 1926. Four medallions from the Arras hoard. Numismatic Notes and Monographs, no. 28. New York: American Numismatic Society. Parsons, H. Alexander. 1926. The earliest coins of Norway. Numismatic Notes and Monographs, no. 29. New York: American Numismatic Society. Newell, Edward T. 1926. Some unpublished coins of eastern dynasts.Numismatic Notes and Monographs, no. 30. New York: American Numismatic Society. Gillingham, Harrold E. 1926. Spanish orders of chivalry and decorations of honour. Numismatic Notes and Monographs, no. 31. New York: American Numismatic Society. Noe, Sydney P. 1927. The coinage of Metapontum (part one). Numismatic Notes and Monographs, no. 32. New York: American Numismatic Society. Newell, Edward T. 1927. Two recent Egyptian hoards. Numismatic Notes and Monographs, no. 33 New York: American Numismatic Society. Rogers, Edgar. 1927. The second and third Seleucid coinage of Tyre.Numismatic Notes and Monographs, no. 34. New York: American Numismatic Society. Bellinger, Alfred R. 1928. The anonymous Byzantine bronze coinage.Numismatic Notes and Monographs, no. 35. New York: American Numismatic Society. Gillingham, Harrold Edgar. 1928. Notes on the decorations and medals of the French colonies and protectorates. Numismatic Notes and Monographs, no. 36. New York: American Numismatic Society. Ravel, Oscar. 1928. The “colts” of Ambracia. Numismatic Notes and Monographs, no. 37. New York: American Numismatic Society. Wood, Howland. 1928. The coinage of the Mexican revolutionists. Numismatic Notes and Monographs, no. 38. New York: American Numismatic Society. Newell, Edward T. 1929. Alexander hoards: IV Olympia. Numismatic Notes and Monographs, no. 39. New York: American Numismatic Society. West, Allen Brown. 1929. Fifth and fourth century gold coins from the Thracian coast. Numismatic Notes and Monographs, no. 40. New York: American Numismatic Society. Perez, Gilbert S. 1929. The leper colony currency of Culion. Numismatic Notes and Monographs, no. 41. New York: American Numismatic Society. Bellinger, Alfred R. 1930. Two hoards of Attic bronze coins. Numismatic Notes and Monographs, no. 42. New York: American Numismatic Society. Cox, D. H. 1930. The Caparelli hoard. Numismatic Notes and Monographs, no. 43. New York: American Numismatic Society. Hill, George Francis. 1930. On the coins of Narbonensis with Iberian inscriptions. Numismatic Notes and Monographs, no. 44. New York: American Numismatic Society. Belden, Bauman L. 1930. A mint in New York. Numismatic Notes and Monographs, no. 45. New York: American Numismatic Society. Newell, Edward T. 1931. The Küchük Köhne hoard. Numismatic Notes and Monographs, no. 46. New York: American Numismatic Society. Noe, Sydney P. 1931. The coinage of Metapontum (part two). Numismatic Notes & Monographs, no. 47. New York: American Numismatic Society. Valentine, Daniel W. 1931. The United States half dimes. Numismatic Notes and Monographs, no. 48. New York: American Numismatic Society. Bellinger, Alfred, R. 1931. Two Roman hoards from Dura-Europos. Numismatic Notes and Monographs, no. 49. New York: American Numismatic Society. Hill, George Francis, Sir. 1931. Notes on the ancient coinage of Hispania Citerior. Numismatic Notes and Monographs, no. 50. New York: American Numismatic Society. Hazelton, Alan W. 1932. The Russian imperial orders. Numismatic Notes and Monographs, no. 51. New York: American Numismatic Society. Ravel, Oscar. 1932. Corinthian hoards (Corinth and Arta). Numismatic Notes and Monographs, no. 52. New York: American Numismatic Society. Cammann, Jean B. 1932. The symbols on staters of Corinthian type: A catalogue. Numismatic Notes and Monographs, no. 53. New York: American Numismatic Society. Weber, Shirley H. 1932. An Egyptian hoard of the second century A.D.Numismatic Notes and Monographs, no. 54. New York: American Numismatic Society. Bellinger, Alfred R. 1932. The third and fourth Dura hoard. Numismatic Notes and Monographs, no. 55. New York: American Numismatic Society. Gillingham, Harrold E. 1932. South American decorations and war medals.Numismatic Notes and Monographs, no. 56. New York: American Numismatic Society. Campbell, William. 1933. Greek and Romam plated coins. Numismatic Notes and Monographs, no. 57. New York: American Numismatic Society. Newell, Edward T. 1933. The fifth Dura hoard. Numismatic Notes and Monographs, no. 58. New York: American Numismatic Society. Cox, Dorothy H. 1933. The Tripolis hoard of French seignorial and Crusader’s coins. Numismatic Notes and Monographs, no. 59. New York: American Numismatic Society. Wood, Howland. 1934. The Gampola larin hoard. Numismatic Notes and Monographs, no. 61. New York: American Numismatic Society. Milne, Joseph G. 1934. The Melos hoard of 1907. Numismatic Notes and Monographs, no. 62. New York: American Numismatic Society. Pradeau, Alberto Francisco. 1934. The Mexican mints of Alamos and Hermosillo.Numismatic Notes and Monographs, no. 63. New York: American Numismatic Society. Newell, Edward T. 1934. A hoard from Siphnos. Numismatic Notes and Monographs, no. 64. New York: American Numismatic Society. Sutherland, C.H.V. 1935. Romano-British imitations of bronze coins of Claudius I. Numismatic Notes and Monographs, no. 65. New York: American Numismatic Society. Gillingham, Harrold E. 1935. Ephemeral decorations. Numismatic Notes and Monographs, no. 66. New York: American Numismatic Society. Mosser, Sawyer McA. 1935. A bibliography of Byzantine coin hoards.Numismatic Notes and Monographs, no. 67. New York: American Numismatic Society. Newell, Edward T. 1935. Five Greek bronze coin hoards. Numismatic Notes and Monographs, no. 68. New York: American Numismatic Society. Bellinger, Alfred R. 1935. The sixth, seventh and tenth Dura hoards.Numismatic Notes and Monographs, no. 69. New York: American Numismatic Society. Waagé, Frederick Oswin. 1935. Greek bronze coins from a well at Megara.Numismatic Notes and Monographs, no. 70. New York: American Numismatic Society. Noe, Sydney P. 1935. The Thurian di-staters. Numismatic Notes and Monographs, no. 71. New York: American Numismatic Society. Walker, John. 1936. The coinage of the second Saffarid dynasty in Sistan.Numismatic Notes and Monographs, no. 72. New York: American Numismatic Society. Newell, Edward T. 1936. The Seleucid coinages of Tyre, a supplement.Numismatic Notes and Monographs, no. 73. New York: American Numismatic Society. Crosby, Margaret and Emily Grace. 1936. An Achaean League hoard.Numismatic Notes and Monographs, no. 74. New York: American Numismatic Society. Brett, Agnes Baldwin. 1936. Victory issues of Syracuse after 413 B.C.Numismatic Notes and Monographs, no. 75. New York: American Numismatic Society. Newell, Edward T. 1936. The Pergamene mint under Philetaerus. Numismatic Notes and Monographs, no. 76. New York: American Numismatic Society. Torrey, Charles Cutler. 1937. Aramaic graffiti on coins of Demanhur.Numismatic Notes and Monographs, no. 77. New York: American Numismatic Society. Noe, Sydney P. 1937. A bibliography of Greek coin hoards (2nd edition).Numismatic Notes and Monographs, no. 78. New York: American Numismatic Society. Lewis, Naphtali. 1937. A hoard of folles from Seltz (Alsace). Numismatic Notes and Monographs, no. 79. New York: American Numismatic Society. Mattingly, Harold and Stebbing, W. P. D. 1938. The Richborough hoard of ‘radiates’ 1931. Numismatic Notes and Monographs, no. 80. New York: American Numismatic Society. Bellinger, Alfred Raymond 1938. Coins from Jerash, 1928-1934. Numismatic Notes and Monographs, no. 81. New York: American Numismatic Society. Newell, Edward Theodore. Miscellanea numismatica: Cyrene to India.Numismatic Notes and Monographs, no. 82. New York: American Numismatic Society. Bullowa, David M. 1938. The commemorative coinage of the United States, 1892-1938. Numismatic Notes and Monographs, no. 83. New York: American Numismatic Society. Newell, Edward T. 1939. Late Seleucid mints in Ake-Ptolemais and Damascus.Numismatic Notes and Monographs, no. 84. New York: American Numismatic Society. Bellinger, Alfred R. 1939. The eighth and ninth Dura hoards. Numismatic Notes and Monographs, no. 85. New York: American Numismatic Society. Gillingham, Harrold Edgar. 1939. Counterfeiting in colonial Pennsylvania.Numismatic Notes and Monographs, no. 86. New York: American Numismatic Society. Miles, George C. 1939. A Byzantine weight validated by al-Walid. Numismatic Notes and Monographs, no. 87. New York: American Numismatic Society. Gonzalez, Jaime. 1940. A Puerto Rican counterstamp. Numismatic Notes and Monographs, no. 88. New York: American Numismatic Society. Gillingham, Harrold Edgar. 1940. Mexican decorations of honour. Numismatic Notes and Monographs, no. 89. New York: American Numismatic Society. Brown, Donald Frederic. 1940. Temples of Rome as coin types. Numismatic Notes and Monographs, no. 90. New York: American Numismatic Society. Work, Eunice. 1940. The earlier staters of Heraclea Lucaniae. Numismatic Notes and Monographs, no. 91. New York: American Numismatic Society. Cox, Dorothy Hannah. 1941. A Tarsus coin collection in the Adana museum.Numismatic Notes and Monographs, no. 92. New York: American Numismatic Society. Ives, Herbert Eugene. 1941. Foreign imitations of the English noble. Numismatic Notes and Monographs, no. 93. New York: American Numismatic Society. West, Louis C. 1941. Gold and silver coin standards in the Roman empire.Numismatic Notes and Monographs, no. 94. New York: American Numismatic Society. McIlvaine, Arthur D. 1941. The silver dollars of the United States of America: With a short sketch of the 1804 dollars. Numismatic Notes and Monographs, no. 95. New York: American Numismatic Society. Milne, Joseph Grafton. 1941. Kolophon and its coinage: A study. Numismatic Notes and Monographs, no. 96. New York: American Numismatic Society. Mosser, Sawyer McArthur. 1941. The Endicott gift of Greek and Roman coins, including the “Catacombs” hoard. Numismatic Notes and Monographs, no. 97. New York: American Numismatic Society. Hume, Edgar Erskine. 1942. The medals of the United States Army medical department and medals honoring Army medical officers. Numismatic Notes and Monographs, no. 98. New York: American Numismatic Society. Sigler, Phares O. 1943. Sycee silver. Numismatic Notes and Monographs, no. 99. New York: American Numismatic Society. Noe, Sydney P. 1942. The Castine deposit: An American hoard. Numismatic Notes and Monographs, no. 100. New York: American Numismatic Society. Bowker, Howard Franklin. 1943. A numismatic bibliography of the Far East: A check list of titles in European languages. Numismatic Notes and Monographs, no. 101. New York: American Numismatic Society. Noe, Sydney P. 1943. The New England and willow tree coinages of Massachusetts. Numismatic Notes and Monographs, no. 102. New York: American Numismatic Society. Chang, Nai-chi. 1944. An inscribed Chinese ingot of the XII century A.D.Numismatic Notes and Monographs, no. 103. New York: American Numismatic Society. McKay, George L. 1944. Early American currency: Some notes on the development of paper money in New England colonies with 36 reproductions of engraved typographic specimens. Numismatic Notes and Monographs, no. 104. New York: American Numismatic Society. Newell, Edward Theodore. 1945. The Byzantine hoard of Lagbe. Numismatic Notes and Monographs, no. 105. New York: American Numismatic Society. Risk, James Charles. 1945. British orders and decorations. Numismatic Notes and Monographs, no. 106. New York: American Numismatic Society. Trell, Bluma L. 1945. The Temple of Artemis at Ephesos. Numismatic Notes and Monographs, no. 107. New York: American Numismatic Society. Castelin, Karel O. 1946. The coinage of Rhesaena in Mesopotamia. Numismatic Notes and Monographs, no. 108. New York: American Numismatic Society. Boyce, Aline Abaecherli. 1947. Coins of Tingi with Latin legends. Numismatic Notes and Monographs, no. 109. New York: American Numismatic Society. Noe, Sydney P. 1947. The oak tree coinages of Massachusetts. Numismatic Notes and Monographs, no. 110. New York: American Numismatic Society. Miles, George C. 1948. Early Arabic glass weights and stamps: With a study of the manufacture of eighth-century Egyptian glass weights and stamps, by Frederick R. Matson. Numismatic Notes and Monographs, no. 111. New York: American Numismatic Society. Hill, Philip V. 1949. Barbarous radiates: Imitations of third-century Roman coins. Numismatic Notes and Monographs, no. 112. New York: American Numismatic Society. Frye, Richard Nelson. 1949. Notes on the early coinage of Transoxiana.Numismatic Notes and Monographs, no. 113. New York: American Numismatic Society. Dillistin, William H. 1949. Bank note reporters and counterfeit dectectors 1826-1866. Numismatic Notes and Monographs, no. 114. New York: American Numismatic Society. Eklund, O. P. and Noe, Sydney P. 1949. Hacienda tokens of Mexico. Numismatic Notes and Monographs, no. 115. New York: American Numismatic Society. Grant, Michael. 1950. Aspects of the principate of Tiberius: Historical comments on the colonial coinage issued outside Spain. Numismatic Notes and Monographs, no. 116. New York: American Numismatic Society. Torrey, Charles Cutler. 1950. Gold coins of Khoḳand and Bukhārā. Numismatic Notes and Monographs, no. 117. New York: American Numismatic Society. Miles, George C. 1950. Rare Islamic coins. Numismatic Notes and Monographs, no. 118. New York: American Numismatic Society. Seyrig, Henri. 1950. Notes on Syrian coins. Numismatic Notes and Monographs, no. 119. New York: American Numismatic Society. Miles, George C. 1951. Early Arabic glass weights and stamps: A supplement.Numismatic Notes and Monographs, no. 120. New York: American Numismatic Society. Miles, George C. 1951. Fatimid coins in the collection of the University Museum, Philadelphia, and the American Numismatic Society. Numismatic Notes and Monographs, no. 121. New York: American Numismatic Society. Wang, Yü-ch’üan. 1951. Early Chinese coinage. Numismatic Notes and Monographs, no. 122. New York: American Numismatic Society. Levi, Annalina Caló. 1952. Barbarians on Roman imperial coins and sculpture.Numismatic Notes and Monographs, no. 123. New York: American Numismatic Society. Robinson, David Moore. 1952. A hoard of silver coins from Carystus.Numismatic Notes and Monographs, no. 124. New York: American Numismatic Society. Noe, Sydney Philip. 1952. The pine tree coinage of Massachusetts. Numismatic Notes and Monographs, no. 125. New York: American Numismatic Society. Raymond, Doris. 1953. Macedonian regal coinage to 413 B.C. Numismatic Notes and Monographs, no. 126. New York: American Numismatic Society. Scott, Kenneth. 1953. Counterfeiting in colonial New York. Numismatic Notes and Monographs, no. 127. New York: American Numismatic Society. Ives, Herbert Eugene. 1954. The Venetian gold ducat and its imitations.Numismatic Notes and Monographs, no. 128. New York: American Numismatic Society. Caley, Earle R. 1955. Chemical composition of Parthian coins. Numismatic Notes and Monographs, no. 129. New York: American Numismatic Society. Lang, David Marshall. 1955. Studies in the numismatic history of Georgia in Transcaucasia, based on the collection of the American Numismatic Society.Numismatic Notes and Monographs, no. 130. New York: American Numismatic Society. Nesmith, Robert I. 1955. The coinage of the first mint of the Americas at Mexico City, 1536-1572. Numismatic Notes and Monographs, no. 131. New York: American Numismatic Society. Scott, Kenneth. 1955. Counterfeiting in colonial Pennsylvania. Numismatic Notes and Monographs, no. 132. New York: American Numismatic Society. Kraay, Colin M. 1956. The aes coinage of Galba. Numismatic Notes and Monographs, no. 133. New York: American Numismatic Society. Wallace, William P. 1956. The Euboian League and its coinage. Numismatic Notes and Monographs, no. 134. New York: American Numismatic Society. Newman, Eric P. 1956. Coinage for colonial Virginia. Numismatic Notes and Monographs, no. 135. New York: American Numismatic Society. Noe, Sydney P. 1956. Two hoards of Persian sigloi. Numismatic Notes and Monographs, no. 136. New York: American Numismatic Society. Buttrey, Theodore V. 1956. The triumviral portrait gold of the quattuorviri monetales of 42 B.C. Numismatic Notes and Monographs, no. 137. New York: American Numismatic Society. Adelson, Howard L. 1957. Light weight solidi and Byzantine trade during the sixth and seventh centuries. Numismatic Notes and Monographs, no. 138. New York: American Numismatic Society. Grabar, Oleg. 1957. The coinage of the Tūlūnids. Numismatic Notes and Monographs, no. 139. New York: American Numismatic Society. Scott, Kenneth. 1957. Counterfeiting in colonial Connecticut. Numismatic Notes and Monographs, no. 140. New York: American Numismatic Society. Miles, George C. 1958. Contributions to Arabic metrology. I, Early Arabic glass weights and measure stamps acquired by the American Numismatic Society 1951-1956. Numismatic Notes and Monographs, no. 141. New York: American Numismatic Society. Newman, Eric P. 1959. The secret of the Good Samaritan shilling : supplemented with notes on other genuine and counterfeit Massachusetts silver coins. Numismatic Notes and Monographs, no. 142. New York: American Numismatic Society. Miles, George Cr. 1959. Excavation coins from the Persepolis region.Numismatic Notes and Monographs, no. 143. New York: American Numismatic Society. Breckenridge, James Douglas. 1959. The numismatic iconography of Justinian II (685-695, 705-711 A.D.). Numismatic Notes and Monographs, no. 144. New York: American Numismatic Society. Cox, Dorothy Hannah. 1959. Coins from the excavations at Curium, 1932-1953.Numismatic Notes and Monographs, no. 145. New York: American Numismatic Society. Bruun, Patrick. 1961. Studies in Constantinian chronology. Numismatic Notes and Monographs, no. 146. New York: American Numismatic Society. Bedoukian, Paul Z. 1962. Coinage of Cilician Armenia. Numismatic Notes and Monographs, no. 147. New York: American Numismatic Society. Adelson, Howard L. and George L. Kustas. 1962. A bronze hoard of the period of Zeno I. Numismatic Notes and Monographs, no. 148. New York: American Numismatic Society. Bellinger, Alfred R. 1962. Victory as a coin type. Numismatic Notes and Monographs, no. 149. New York: American Numismatic Society. Miles, George C. 1963. Contributions to Arabic metrology. II, Early Arabic glass weights and measure stamps in the Benaki Museum, Athens and the Peter Ruthven Collection, Ann Arbor. Numismatic Notes and Monographs, no. 150. New York: American Numismatic Society. Caley, Earle, R. 1964. Orichalcum and related ancient alloys: Origin, composition, and manufacture, with special reference to the coinage of the Roman Empire. Numismatic Notes and Monographs, no. 151. New York: American Numismatic Society. Tomasini, Wallace John. 1964. The barbaric tremissis in Spain and Southern France: Anastsius to Leovigild. Numismatic Notes and Monographs, no. 152. New York: American Numismatic Society. Boyce, Aline Abaecherli. 1965. Festal and dated coins of the Roman Empire: Four papers. Numismatic Notes and Monographs, no. 153. New York: American Numismatic Society. Caley, Earle R. 1965. Metrological tables. Numismatic Notes and Monographs, no. 154. New York: American Numismatic Society. Williams, Roderick T. 1965. The confederate coinage of the Arcadians in the fifth century B.C. Numismatic Notes and Monographs, no. 155. New York: American Numismatic Society. Eddy, Samuel K. 1967. The minting of antoniniani A. D. 238-249 and the Smyrna Hoard. Numismatic Notes and Monographs, no. 156. New York: American Numismatic Society. Fagerlie, Joan M. 1967. Late Roman and Byzantine solidi found in Sweden and Denmark. Numismatic Notes and Monographs, no. 157. New York: American Numismatic Society. Morrison, Karl F. 1967. Carolingian coinage. Numismatic Notes and Monographs, no. 158. New York: American Numismatic Society. Thompson, Margaret. 1968. The Agrinion hoard. Numismatic Notes and Monographs, no. 159. New York: American Numismatic Society. Miles, George C. 1970. The coinage of the Arab amirs of Crete. Numismatic Notes and Monographs, no. 160. New York: American Numismatic Society. MacDowall, David W. 1979. The western coinages of Nero. Numismatic Notes and Monographs, no. 161. New York: American Numismatic Society. Troxell, Hyla A. 1982. The coinage of the Lycian League. Numismatic Notes and Monographs, no. 162. New York: American Numismatic Society. Johnston, Ann. 1984. The coinage of Metapontum Parts 1 and 2. By Sydney P. Noe. Numismatic Notes and Monographs, nos. 32 & 47. New York: American Numismatic Society. Stahl, Alan M. 1985. The Venetian tornesello: A medieval colonial coinage.Numismatic Notes and Monographs, no. 163. New York: American Numismatic Society. Johnston, Ann. 1990. The coinage of Metapontum, part 3. Numismatic Notes and Monographs, no. 164. New York: American Numismatic Society. Koch, Heidemarie. 1990. A hoard of coins from eastern Parthia. Numismatic Notes and Monographs, no. 165. New York: American Numismatic Society. Metcalf, William E. 1996. The silver coinage of Cappadocia, Vespasian-Commodus. Numismatic Notes and Monographs, no. 166. New York: American Numismatic Society. Adams, John W. 2005. The medals concerning John Law and the Mississippi system. Numismatic Notes and Monographs, no. 167. New York: American Numismatic Society. Fischer-Bossert, Wolfgang. 2008. The Athenian decadrachm. Numismatic Notes and Monographs, no. 168. New York: American Numismatic Society. Kleeberg, John M. 2009. 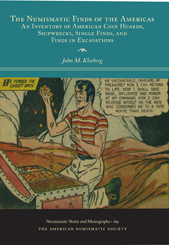 Numismatic finds of the Americas: an inventory of American coin hoards, shipwrecks, single finds, and finds in excavations. Numismatic Notes and Monographs, no. 169. New York: American Numismatic Society.